Texting has caught a bad rap. From texting while driving to breaking up via text. It has been accused of robbing people of “real” human interactions but the truth is…real is relative. 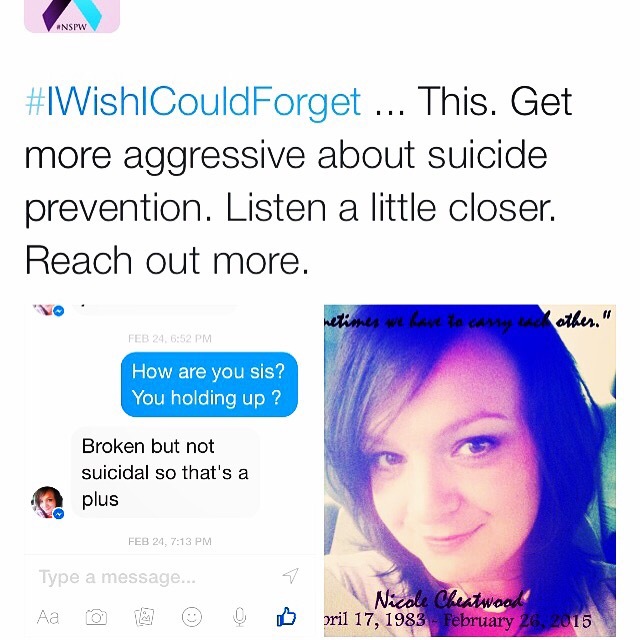 The picture above is courtesy of one of my favorite fellow #SuicidePrevention advocates Grace Durbin. She would always text her sister Nicole to check on her but this text was two days before Nicole took her life. We can’t reach everyone but we can try. Texting a brief word of encouragement or just a simple, “Hey, thought of you!”, could make a difference. As a result of times changing, technology has evolved to include CRISIS TEXT LINES for those who feel more comfortable texting for help. As writers we can relate because writing empowers us to say things we may never verbalize! Check out the resources below for yourself or a loved one. Please share…it just may save a life. Thanks for sharing this…will def tweet!